Please Note: this item is currently low on stock or out of stock and your shipment may be delayed while we replenish our supply. •	Vignettes and scenarios show what the essential ideas look like in practice. •	Student writing samples illustrate both strong examples and common student difficulties with scientific explanations. •	Video clips from actual elementary classrooms demonstrate scientific explanations at different levels of complexity and across different science topics. 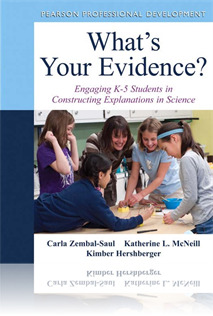 •	Strategies to support all students in constructing scientific explanations in both talk and writing help with students with a wide range of backgrounds and experiences, including English Language Learners and students with special needs. •	Check points synthesize key points and give teachers a road map of the essential ideas in the book. •	Study group questions at the end of each chapter can be used individually or in groups to help reflect on and apply the key ideas.